When it came to choosing a successor to Joe Shaw, Chesterfield appointed a manager with no senior playing pedigree for the first time since the appointment of JJ Caffrey in 1920. That was not Arthur Cox’s fault; he joined Coventry City from school but his career was brought to a crashing halt by a broken leg at the age of 18. Nine years on the Highfield Road coaching staff were followed by spells at Walsall, Aston Villa, Halifax, Blackpool and Preston, but he became best-known as Bob Stokoe’s assistant at Sunderland when they won the Cup in 1973. Arthur was manager at Galatasaray prior to joining Chesterfield; his wife could not settle out there, though, and he applied for the Spireites job after being pipped to the post of Mansfield manager by Peter Morris. Cox took up office on October 8th, 1976. Characteristically forthright, he made no promises but pledged that tough decisions would be made for the betterment of the club. After defeat in his opening game the side went on an unbeaten run that included a 7-0 victory over Bury that has entered Spireite folklore. With half the pitch icebound, Cox sent his team out in pimple-soled boots. This gave them an advantage over the visitors, who had only brought regular, studded boots. Bury officials were keen to go into town to buy appropriate footwear but were prevented from doing so by Cox; having told the Bury men that he would order a taxi for them he didn’t, and came up with a series of imaginative excuses for its non-arrival. By the time the Bury men got back with their boots, their side was 4-0 down. Cox ordered the team in for training through the close season of 1977 and the side hit the ground running, but injuries to six key players forced a mid-table finish to the 1977-8 season. Still, other clubs noticed an improvement; Blackpool’s efforts to take Cox to Bloomfield Road were rebuffed and Arthur was offered a five-year contract at Chesterfield. Moves to bring in a decent striker stalled as clubs demanded higher fees, causing Cox to observe that “It is reasonably easy to buy players if you are prepared to pay exorbitant fees.” A few days later he smashed the club’s record for a fee paid, laying out £35,000 for Leicester’s Geoff Salmons. ’78-9 was a strange season; the club finished 20th but the standard of football played was, according to Arthur, “Far above the standard of the third division.” Still, Arthur was moved to make a substantial overhaul of the playing staff in the summer of 1979, bringing in Bill Green, John Ridley, Alan Crawford and Alan Birch. This side played sparkling football and gave fans memories of fine games that linger to this day. The side sat in third place in March and Cox splashed out £300,000 that the club could not remotely afford on the signings of John Turner, Phil Bonnyman and John Stirk. This did not provide the extra impetus for promotion; indeed, the replacement by Bonnyman of the popular but under-rated Andy Kowalski seemed to dent the players’ morale. The loss of Bill Green’s leadership through injury allowed Sheffield Wednesday to push the Spireites out of the promotion picture. Chesterfield went further into debt in the summer of 1980, signing Bury’s Danny Wilson for £100,000. From almost the moment he was signed, the club began to default on payments; Wilson’s unquestioned ability on the field masked the financial consequences of his signing, though. 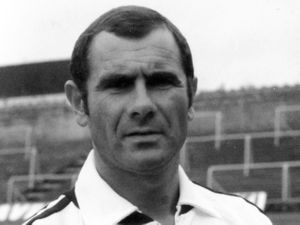 Having qualified for the later stages of the Anglo-Scottish Cup the side were well-placed in the league when Newcastle United approached the board, and on September 4th Cox was announced as the Magpies’ new manager. A Chesterfield pub held a minutes’ silence on hearing the news. Cox built an attractive Newcastle side around Kevin Keegan and the two formed a bond that saw Arthur serve as Keegan’s assistant at club and international level. After following Keegan to Fulham, Manchester City and the England job, Arthur rejoined “The Messiah” at Newcastle in January 2008. On the field, Cox’s Chesterfield legacy was an entertaining side that came within a whisker of restoring second division football to the town. Behind the scenes, though, “Mad Arthur” left a ticking bomb of debt. As the 1980s wore on the struggle to manage that debt became hopeless and, in the days before the soft option of administration, the Chesterfield Football Club came within hours of ceasing to exist. The last remnant of Arthur’s legacy is perhaps an understandable sense of caution among older fans, to temper the younger ones’ complaints of a lack of ambition.